Professional Coin Grading Service has certified the coins from the D. Brent Pogue Collection that will be offered starting in May in the first of a series of auctions jointly conducted by Stack’s Bowers Galleries and Sotheby’s. The collection has been described as the most valuable collection of federal American coins in private hands. The holders of each PCGS-certified coin features special gold insert label to indicate the D. Brent Pogue Collection pedigree. A total of 128 coins from the May auction, along with additional key rarities from the collection, will be displayed at the January 29 – 31, 2015 Long Beach Coin, Currency, Stamp & Sports Collectible Expo at the Stack’s Bowers booth, #502. “This collection emphasizes superb quality United States coins of the early years, 1792 to the late 1830s, that were carefully acquired over several decades by Mr. Pogue with the support of his family in Dallas, Texas,” explained Christine Karstedt, Executive Vice President of Stack’s Bowers. 1797 Draped Bust Dime JR-1. 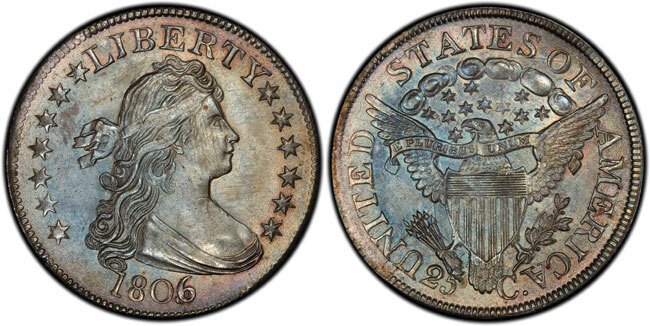 16 Stars, PCGS MS-66 – tied for finest known. 1797 Draped Bust Dime JR-2. 13 Stars, PCGS MS-64 – tied for finest known. “PCGS is pleased to have been selected by Stack’s Bowers Galleries and the Pogue family to certify this historic collection. The D. Brent Pogue Collection will be remembered as one of the finest collections of early American coins ever offered. It’s a thrill for us to see so many great rarities in one collection,” said Willis. About PCGS: Professional Coin Grading Service (www.pcgs.com) represents the industry standard in third-party certification. Founded in 1986, PCGS experts have examined, authenticated and graded more than 29 million coins with a combined total value of $29 billion. About Stack’s Bowers: Stack’s Bowers Galleries (www.stacksbowers.com) is well known for conducting live, Internet and specialized auctions of rare U.S. and world coins and currency and ancient coins, as well as direct sales through retail and wholesale channels. About Sotheby’s: Sotheby’s (www.sothebys.com) has ten auction salesrooms around the world and has been uniting collectors with world-class works of art since 1744.